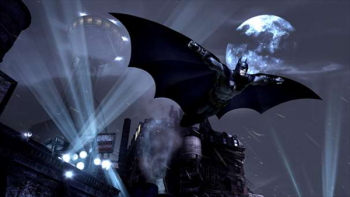 The chief developer of Arkham City says the new game is bigger and more Batman-ey than Arkham Asylum. The reason that Arkham Asylum was our 2009 Game of the Year was because it blended brilliant game mechanics with the story and setting. Playing Asylum felt like you actually were Batman trapped in Arkham with The Joker pulling the strings. Due to the critical and commercial success, Rocksteady Games began work on a sequel that follows the recipe of first game but offers the player much more space to inhabit. In fact, Sefton Hill the game's director said that Arkham City provides a game area that is five times bigger, but that doesn't mean the sequel is truly an open world. "The footprint of Arkham City is about five times bigger than Arkham Island, but our primary intention was never to create a bigger gameworld just for the sake of it," Sefton said. "In Batman: Arkham Asylum, we really focused our effort on creating an intense, pressure-cooker atmosphere by locking Batman in the madhouse and allowing The Joker to turn up the heat. In Arkham City, we want to take that attitude to the next level, so we created an experience in which gamers will have a huge amount of navigational freedom, but they will also feel the extreme pressure of the challenges that they face." The result is a game that gives many options but is more narratively driven. "I wouldn't describe the game as "sandbox" because a totally open and free-form gameworld would not allow us to create the kind of atmosphere that we wanted to, but we don't hold your hand either. Arkham City is its own place; a massive superprison, jam packed with supervillains, thugs, and psychopaths. There aren't any rules, but it has a law of its own, and this is why it is a perfect setting for Batman," he said. In an interesting connection between the two games, savvy players of Arkham Asylum might have noticed the plans for Arkham City in the Warden's room. Hill said that the connection was intentional. "The plans in Warden Sharp's secret room are just one example of the way in which the two stories link together. Gamers who have played and completed Batman: Arkham Asylum will definitely see a lot of interesting hooks in Arkham City that connect to the events that happened in Arkham Asylum 18 months earlier." All of this definitely has me excited to play in the third quarter of 2011. That is, if I can stop playing DCUO.